Syria Interview: How Will the Opposition Govern “Liberated” Idlib? Last month a coalition of rebel groups captured Idlib in northwest Syria after a four-day offensive. The provincial capital is the third lost by the Assad regime in the four-year Syrian conflict, but the first to be governed by the opposition — Raqqa is in the hands of the Islamic State and Quneitra is depopulated. Q: Some opposition activists have raised concerns that the fate of Idlib city might be similar to that of Raqqa and Deir ez-Zor [areas of strong Islamic State presence]. What are some factors that would mitigate that possibility? The rebel brigades are in agreement with one another, and have formed a united operations room that enjoys a high level of cooperation in its military work. We agreed, in the operations room, to hand over the city to civil administration, and for the rebel brigades’ role to be limited to protecting the city. As for repeated [regime] bombing of the city, we can’t take control of that situation because of the regime’s warplanes. What you’re seeing in terms of displacement is a result of the continued bombing of the city. Q: After Idlib was liberated, the revolution’s flag was raised in addition to Jabhat a-Nusra’s banner and that of other brigades. What’s the message behind raising the revolutionary flag inside the city? As for the military brigades, every brigade raises its own banner. No one prevents anyone else from raising their flag, the brigades are open, as far as possible, to all others. But there is one condition: that brigades not act in a way that’s separate from the other brigades in the operations room. At the end of the day, the Victory Army operation room’s decisions are for the people’s benefit. Q: The Assyrian Observer accused the opposition brigades of killing a Christian man and his son in the city. The Victory Army announced that it secured a path for the exit of 20 Christian families based on their desire to leave. How are you dealing with the civilians who were under regime control in the city, and Christians in particular? In general, if there isn’t an indication that a person is a regime agent or shabih, he’s dealt with like any civilian in the rest of the liberated areas. For your information, there are some people with bad backgrounds, but as long as there is no proof of [their involvement in regime collaboration] they are not treated differently. A civilian is a civilian. As for the Christians, Sheikh al-Moheisini [a leading cleric with the rebels] said that if they want to live among us that’s their right. We can’t impose the jizya (non-Muslim tax) on them. Subsequently, the Christian will live like any other civilian in Idlib city. Q: Someone close to Ahrar a-Sham wrote that in a leadership-level meeting for the Victory Army, a united administrative council was formed for Idlib city in order to facilitate the city and civilians’ affairs. Will the city be under military rule, or will the rule be civilian? As for administration, according to the Sheikh Abu Jaber, leader of Ahrar a-Sham: “Our goal is not to administer the city, for the city will be handed over to civilian rule.” Our goal is to protect the citizens, even from the warplanes despite a lack of anti-aircraft guns. 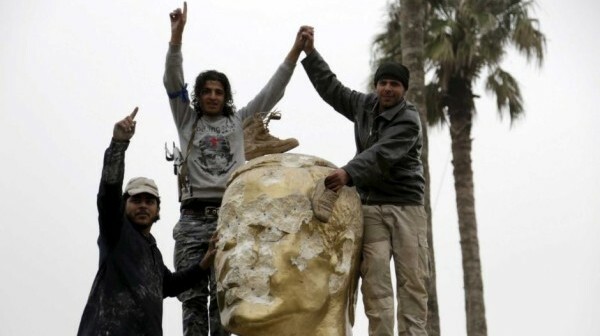 The rebel brigades especially need to remain in the city, out of fear that the regime will try to take it back. I want to emphasize once more that the rebel brigades will not undertake to administer the city. Rather, the administration will be run by civilians: that was what the Victory Army’s operations room agreed upon. Q: Raqqa is Being Silently Slaughtered published news that members of the Hisbeh [Islamic State religious police] announced that IS [Islamic State] will achieve a victory, soon, in Idlib. What steps are you taking in order to prevent the city from falling into their hands? They won’t have any luck in Idlib. Their presence is far away from the city, keeping in mind that they have some areas of control in the eastern Idlib countryside. The areas of Idlib, God willing, will not witness any IS presence. Q: What are the plans or future steps for Ahrar a-Sham in the area in order to gain the support of civilians? 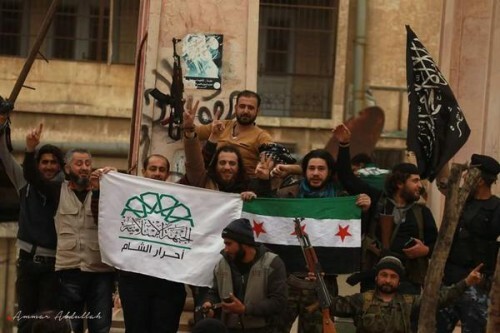 There’s a slogan, “Ahrar a-Sham is a People’s Revolution.” What sets Ahrar a-Sham apart is that its fighters are Syrian, I think that the percentage of foreigners is not more than 1% of the movement. Considering that the movement’s fighters are the sons of Syria, this makes them close to the Syrian people and their aspirations. PreviousBBC Radio: Is Hillary on the Way to the White House?